There are some occupations — astronaut, surgeon, or prima ballerina, for example — in which people rarely succeed without being rocket-fueled by commitment and passion … and it is unlikely that their employers spend much time worrying about their level of “engagement.” But I think it is probably safe to say that most people are driving to their jobs every morning with an inner sense of purpose that is moderately-to-considerably less intense. Whatever your industry, your employees can feel more fulfilled and connected in a workplace that encourages and fosters engagement. Most don’t. Engagement is tricky because it is impossible to force it or to fake it. And it doesn’t help that most working conditions are designed in ways that actually suppress it. Routines, dress codes, all the impersonal rules and regulations or professional conduct, strict schedules, deadlines, and stress, are all natural joy-killers. The employment contract, in its lowest form, is an impersonal exploitative exchange of needed labor for needed money, with no regard for psychological enrichment . If you have employees working at this level, they may view “engagement” initiatives as a cynical attempt to squeeze more from their end of the bargain. And if you regard your employees at this level, you might be spinning your wheels trying to convince them otherwise. But if you are like most of our clients, 1) you have a sincere desire to cultivate a more meaningful, authentic work experience, and 2) you are operating under significant budget, schedule, and customer pressures. If you are working in good faith, with limited resources, to elevate the employment contract on BOTH sides, toward mutually rewarding benefits, we can help. The ideas here are easy to implement, but they all take a step further than just “doing something nice” for your workers, because engagement is different than rewarding. By demonstrating to employees that their unique personalities, histories, and points of view are noticed – you can cultivate feelings of connectedness and a spirit of personal commitment. We offer below some relatively painless ways to jump start your engagement efforts. By implementing one or more techniques, see what you can achieve in 2019! 1) Self-Managed Office Rewards. Do you occasionally buy a pizza lunch for the office? It’s a super nice gesture, and usually well-appreciated, but it does little to foster engagement. Take whatever monthly budget you have for those pizzas, and assign rotating control over determining how to treat the office. This cultivates engagement because, while being given a slice of pizza puts one in the role of a child, being handed the controls is an assignment of trust and an opportunity to exercise influence. The resulting efforts will include a variety of hits, misses, feedback, and creativity … not to mention a helpful awareness that it’s not so easy to make employees happy! One employee may stock the breakroom with bags of chips that will last a long time but aren’t very exciting. Another will have to decide whether to arrange a catered spaghetti lunch even though a couple co-workers don’t eat gluten. Somebody else might want to schedule an on-site yoga class! It doesn’t take a huge budget to invite your employees to learn about, appreciate, and surprise each other while making their own impact on the workplace. 2) Where We Came From, Who We Are. Ask current and all new employees to provide photo of themselves from the past – as a child, baby, or adolescent. Select a common area in your workplace to display framed childhood photos of the entire staff (or post outside of each office or cubicle). The collection must include owners or top executives … as with every other idea on this list, any exclusion of top management will generate a negative condescending vibe. 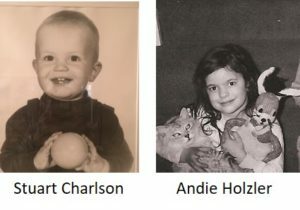 On one level, it’s simply fun to look at and recognize each other from childhood photos. On a higher level, this activity acknowledges the individual histories and lifetime development of every employee, encouraging awareness of who played the violin, who was a middle kid, who grew up in a city apartment or a rural farm … you have an office full of multi-dimensional human beings who will feel more engaged when these aspects of themselves are shared. The most popular method to support volunteerism is to offer employees paid time off for approved volunteer programs. Don’t be too quick to write this off as impractical …. just an hour or two every quarter, or even a few hours once a year, can be profoundly gratifying. 4) Celebrating What Matters: Hopefully you are already acknowledging birthdays, but you know what? For most of your employees, birthdays are not the most significant event of the year. In addition to celebrating obvious high profile events like marriage and childbirth, drill further to uncover what is bringing joy to your employees: did someone finish a 5K, win a recipe contest, sign up for French lessons, buy a new car, adopt a rescue dog, or send their daughter off to college? Whether you post company news via Facebook, Twitter, internal bulletins, or group meeting announcements … allow and encourage recognition of important events that are outside of the workplace. If you don’t have an established venue for this type of communication, you could install a line of dry erase boards along a wall for employees to record the year’s timeline of events that hold significance, both inside and outside of the office. At year’s end, employees can enjoy a visual recap of everything that made the year meaningful. 5) Old-Fashioned Suggestion Box: It no longer has to be a physical box, but the rationale behind this classic concept is timeless. Nobody knows more about how processes can be improved than the people doing the work, and if you aren’t open to listening to an employee’s ideas, you not only dampen engagement, but may be missing out on potential benefits. There are multiple variations for implementing a suggestion program. It can be anonymous or require sponsorship. Topics can be unlimited and open-ended, or, creative solutions to specific problems can be solicited with deadlines. Brainstorming sessions or voting may be incorporated to establish a path from suggestion to action. Even if the specific parameters of your program are not perfectly optimal from the start, your employees will get the message that their voices can be heard. 6) Going To the Dogs: We’ve already written a separate blog on the power of pet-friendly policies to create strong employee engagement, so we won’t repeat the full article. Note: Employee engagement will be one of ConsultStu’s featured themes throughout 2019. Last year’s record employment rates, hot economy and wage increases have our clients facing recruitment and retention issues that have fast become major front burner subjects today. Give your business a competitive edge by focusing on the employment experience and see how it can help your organization thrive.